Visually and audibly this was the most active sitting in red light for many years. Both Tracey and Rachel saw the same fast moving white lights on multiple occassions as well as flashes of localised white light. At one point a small white light travelled between the cabinet and the sitter's chair, Tracey was able to follow it till it faded with a pop, which was out of sight but heard by Rachel. There were snatches of voices heard around the room but only by one person at a time and a great many taps on surfaces within the room. The recording of the seance is as astounding as the physical phenomena we witnessed. We have no expectation that you dear reader will believe that there are only two physical people in the room but there are. The tonal quality of the voices is the same as our own for a significant amount of clips. Of course a larger majority are less impressive but most are evidential in some way, rather than uncontextual or nonsense. We are absolutely delighted with our progress and are looking forward to our next sitting. EVP 1: Rachel is describing to Tracey, the appearance of a medieval lady, with a dark over dress on top of a white undergarment. The speaker of the comment sounds male and has a distinctly different accent to both Rachel and Tracey. It may be that the lady was wearing her funeral attire. 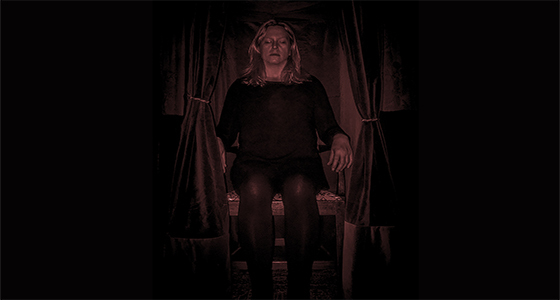 EVP 2: It is usual for Rachel to remain as still as possible during active periods in the cabinet but on this occassion, a communicator had asked her to move her head to one side. You can hear the consternation in Tracey's voice when she asks if Rachel had moved her head; she had but Tracey reported her head as being perfectly stationary for the duration of the experiment; this has never been done before. The speaker is clearly not one of us and sounds male, unfortunately we do not know who he is but we are excited by his success. EVP 3: This is an entertaining clip that illustrates how easy it is to be looking at the wrong feature of a transfiguration and how very forthright the directing communicators can be; unfortunately because of the nature of EVP, Tracey was not able to refocus her attention upon the area of the transfiguration that the communicator was modifying. The speaker is female and has a very similiar but not identical accent to Tracey. EVP 4: This is an exceptionally rare clip for many reasons; Rachel has asked for an entity to come forward that we have no way of communicating with in our language, they were asked to make a noise because we were unsure if speech was possible. The speaker of the clip is male and is directing another communicator to come forward. We consider this to be excellent evidence that we work with a parallel team helping individuals make themselves known to us. EVP 5: The clarity of the two voices in our final clip is not good, however as both Rachel and Tracey report seeing a light at the same time, it is significant. This visual type of phenomena, moving, flashing, white light, is rarely seen in red light and the excitement in the ladies voices is self evident.